The Domaine is open all year long. Extended on 2HA, the Domaine is made of 13 fully equipped wooden houses: 3 bedrooms, sitting room, equipped kitchen, 8 beds, garden furniture, TV, wifi. 2 houses are equipped to welcome handicapped people. The Domaine is ideally located, set back from Dompierre Les Ormes, surrounded by greenery at an altitude of 400 meters. Beautiful landscape and peace and quiet are guaranteed! You can enjoy an indoor heated swimming pool from 1st March to 31 October. Many on-site sport facilities are also available (football, tennis and bowling pitches). 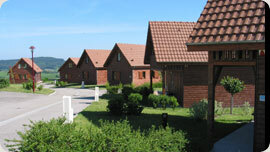 At the exit of the Domaine, you can opt for hiking, biking, or horse riding. Dedicated road signs will help you navigate effectively. With its unique uncluttered arrangement, enjoy the beauty of nature to its fullest with your family.